We have big dreams and plans for our programs and will remain true to our core mission— to create awareness of the Haitian people's struggles and to provide the resources needed to address their problems. However, maintaining funding for our programs is our most pressing need and it is an ongoing battle. Our work is continuous and we need your help to continue helping thousands of kids. Gifts made represent a gift to Consider Haiti. To help the greatest number of families move toward self-reliance, Consider Haiti does not use its limited resources to track gifts from donation to distribution. We use your gifts where they can do the most good by pooling them with the gifts of others to help families towards self-reliance. 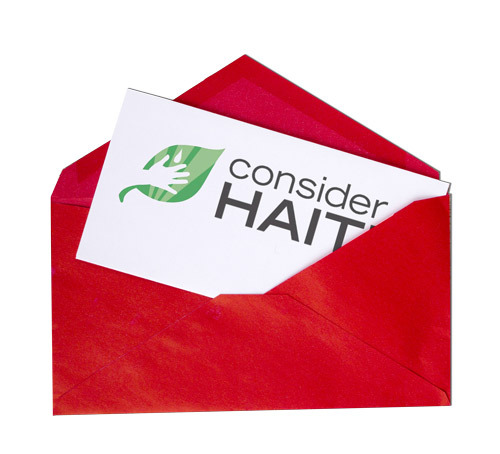 Consider Haiti, Inc. is a 501(c)(3) non-profit organization and all contributions are tax deductible. Donate in the name of a friend family member! Have a friend who has it all? Don't give them another trinket; choose something meaningful! By choosing Consider Haiti as a gift for yourself or in the name of a friend or family member, you help us provide medical care and malnutrition relief for the children of Haiti. It's truly the gift that keeps on giving! If you'd like for us to send a card and description to your recipient on your behalf, simply provide this information in your shopping cart instructions when you check-out.